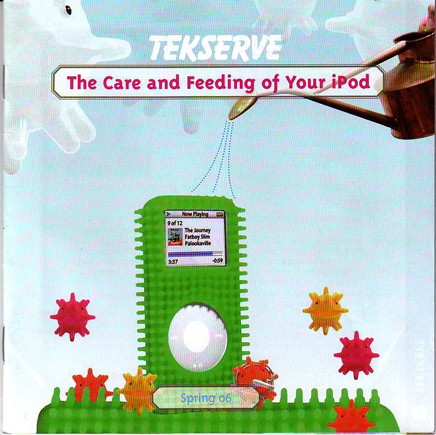 our first and favorite sponsor, TEKSERVE, the fabled ‘Mac’ Store on 23rd Street, made art & tech history with their first ever 15 second ipod ‘loop’ (to call it an ‘ad’ would be a grave injustice, but that’s what it was). An inspired bit of live action, involving hundreds of iPods, filmed at the store, and produced by real TEKSERVE employees, who more often, than not, are talented artists, musicians, writers, and cameramen, as well as tech wizs, on their day job, – it was on the ‘net’ – almost the minute they hit the finished button. MAY 1 – JULY 30, 2006 – so there’s still time to catch it, large scale, if you are in the area.